Comcast is about to get more animated. The company's NBCUniversal division is acquiring the DreamWorks Animation studio for about $3.8 billion. On Thursday, Comcast (CMCSA) said shareholders in DreamWorks will receive $41 in cash per share of stock -- a roughly 50% premium from where the stock was trading before the merger talks were reported earlier this week. Comcast said it expects the deal to pass regulatory muster and take effect by the end of the year. Wall Street applauded the deal, sending the stock up as much as 24% on Thursday morning. The deal is reminiscent -- albeit on a much smaller scale -- to Disney's 2006 acquisition of Pixar for $7.4 billion. Both Comcast and DreamWorks are smaller than Disney and Pixar, respectively, but the ambitions are similar. 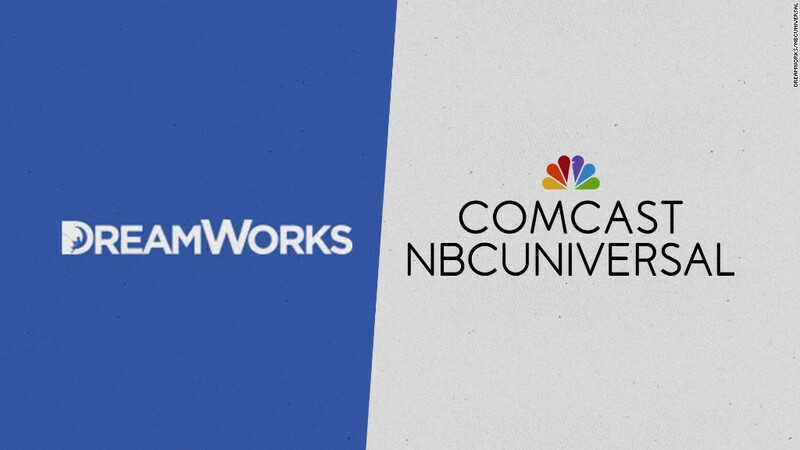 Comcast said DreamWorks "will become part of the Universal Filmed Entertainment Group, which includes Universal Pictures, Fandango, and NBCUniversal Brand Development." NBCUniversal CEO Steve Burke said "DreamWorks will help us grow our film, television, theme parks and consumer products businesses for years to come." His mentions of the theme parks and products was important. While DreamWorks is best known for movies like "Shrek" and "Kung Fu Panda," much of the studio's value to Comcast is in the so-called long tail of amusement park integrations, merchandise, and other synergistic deals. DreamWorks (DWA) CEO Jeffrey Katzenberg will give up his leadership position. But he will remain involved with DreamWorks' ownership interests in two digital ventures: Awesomeness TV and NOVA. His title will be chairman of DreamWorks New Media. Katzenberg will also be a consultant to NBCUniversal, the company said. Since the studio's first film, 1998's "Antz," DreamWorks Animation has brought in more than $5 billion at the North American box office, according to Rentrak (RENT). The biggest blockbuster for the studio was "Shrek 2," which made $436 million in the U.S. in 2004. Comcast declined to comment when it reported quarterly earnings on Wednesday. Evidently the company was putting the finishing touches on the deal. The deal includes a $200 million reverse breakup fee that Comcast would have to pay DreamWorks if regulators don't approve the acquisition. The Wall Street Journal first reported on the acquisition talks on Tuesday. --CNNMoney's Frank Pallotta and Matt Egan contributed to this report.